foodiecart 8 years, 8 months ago. First – fix your link above to drop the ‘.’ from the Twitter link. It is not working. More importantly, best of luck on this! A great idea and I am looking forward to trying it. Yeah, best of luck. Also looking forward to it! I’m already sold on it even though I don’t know what a Japanese crepe would consist of…*fixed*. Intrigued. I wish you well and keep us updated. thx for the support! 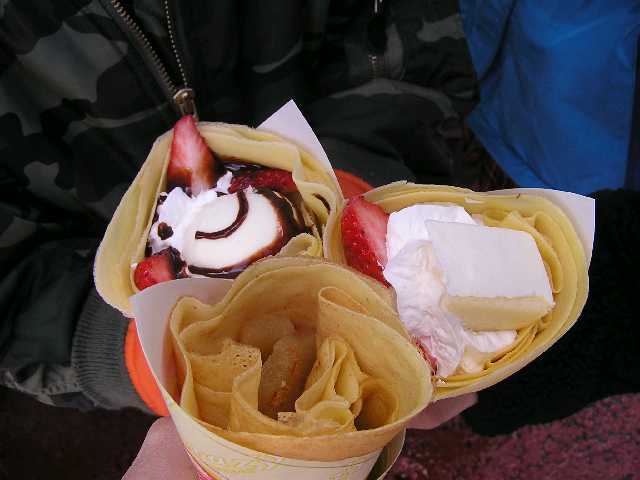 the major difference between a japanese crepe and others is the thickness. Our crepe will be pretty thin. This looks interesting, can’t wait to try it! Welcome. Please post where you will be for us ludites who don’t twitter. It appears the Japanese recipe uses self rising flour and less dairy products. In some cases substituting soy milk. Out of general interest, are they vegan? no they aren’t vegan, but we will work on one if the demand is there. we have limited space so we opted for the gluten-free and original. we may try to make the gluten-free crepe vegan as well. not sure yet. we might be able to make a vegan crepe with japanese mountain potato and soymilk. we will play with this today. what sorts of ingredients are in a japacrepe? i love japanese food and crepes. If they are anything like okonomiyaki, I am *so* there. The forum ‘Dining’ is closed to new topics and replies.